I posted my first recipe on this blog one year ago today. I wanted to challenge myself to try different techniques, develop new recipes and become a better writer. I set myself the task of writing a post a week and launched into it - half expecting it to last a month or two before I ran out of time, or energy, or enthusiasm... or recipes. 365 days on, I have written (or written about) 63 recipes, started selling my cakes and have had some pretty amazing opportunities cooking with chefs much better than myself. In short, it's changed my life in ways I couldn't ever have imagined. Still the cake I bake more than any other. It's warm, floral and heady, and bursts with the taste of spring. Rose and Pistachio Cake. Murder on the Orient Express. My favourite cake (it's hard to pick one, but if I did this would have to be it). So wonderfully reminiscent of holidaying in Turkey - dense and delicious. The cakes that remind me most of home, though so much better homemade than anything I used to put in my school lunchbox. Today, the first day of spring, has brought with it a real sense of excitement that in three months I'll be eating these again. Apple and Almond Cake. The Secret Garden. An old favourite, and one that inspired the news that will be forthcoming at the end of this post. 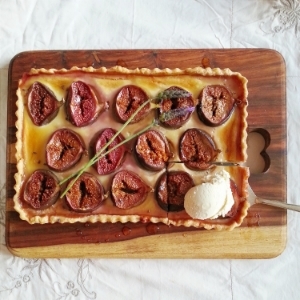 A 2014 favourite that hasn't made it onto the blog - fig, honey and ricotta tart with honey and lavender ice-cream. I have so much enjoyed the focus and restriction that writing about cakes and desserts has given me over the past year. That said, it's really the link to the stories that I've relished. I've loved poring over my old favourites, and discovering food in new novels. However, I have found myself passing over some iconic lunches and dinners with a slightly wistful air. So, from this week, I will be featuring savoury meals on this blog too. Keep your suggestions coming - I have no doubt that this extension of the parameters will give rise to a huge number of new ideas. Finally, I want to leave you with some exciting news. In London on 09 May, I will be hosting my first three-course supper club, based around The Secret Garden. Expect honey, lamb and lots of fresh veg to feature. Keep your eyes peeled here for more information if you'd like to joint me - it will go on sale in early April. For now, happy reading and good eating. ps. The shot at the top of this post is by my lovely friend Lean - we spent a wonderful day recently baking doughnuts, eating oysters and wandering around London. You can read about it all here soon!